In animal welfare, one of the main issues that many pet rescues face is overcrowding. Even with high adoption rates, rescue organizations often struggle with finding pets their forever homes faster than the rate at which pets are being taken in. With dogs entering rescues at a faster rate than they are being adopted, it becomes clear that other measures must be taken in order to prevent overcrowding at shelters, which can lead to euthanization. Aaron Fisher, the CEO and Founder of the Atlanta Rescue Dog Cafe, believes that the best way to prevent overcrowding at shelters is to prevent them from entering the shelters in the first place. Through education and conversation, the Atlanta Rescue Dog Cafe works to keep dogs out of animal shelters and to create a happier, safer environment for all dogs and their people. The Atlanta Rescue Dog Cafe was started towards the end of 2017 by Aaron Fisher. The first thing that becomes clear when looking at his resume is that Aaron is a man who has worn many hats. Aaron first came to Atlanta in 1993 to attend Emory University, and since then, has spent time living in the Middle East, working with the State Department, teaching elementary school, and eventually, founding a nonprofit organization dedicated to animal welfare. 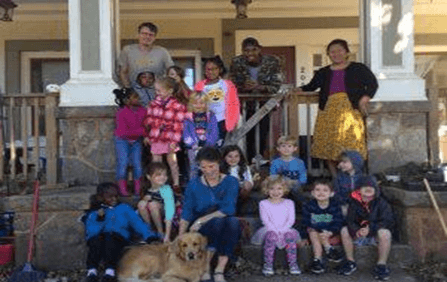 When looking at Aaron’s background as an elementary school teacher, it is not surprising that Atlanta Rescue Dog Cafe places an emphasis on education. While teaching, Aaron’s students became interested in wanting to help pets in shelters. With his students being too young to volunteer at local shelters, Aaron wanted to have someone from the shelters come speak to his students about the rescues and how to handle dogs in safe and healthy ways. What Aaron quickly found was that no such program existed that focused on educating the next generation on animal handling and safety, and responsible pet care. As Aaron began working and volunteering in shelters, it became increasingly evident that there was lack of educational programs in the field. With many rescues, the goal is to find pets homes as quickly as possible. Though adoption rates may be high, the rates of pet neglect and abandonment – leading to them to being placed in shelters – aren’t going down. Through his work in animal welfare, Aaron noticed that even though the rescues primarily operated in response to the problems of pet neglect, cruelty, abandonment, etc., there were very few, if any, organizations working to prevent these issues from arising in the first place. Unfortunately, this imbalance of responding to the problem without addressing the causes leads to rising abuse and neglect rates that the rescue shelters’ adoption rates cannot keep up with. This is where Atlanta Rescue Dog Cafe comes in. By focusing on education and conversation with people of all ages, Atlanta Rescue Dog Cafe works to save rescue dogs by keeping them out of shelters in the first place. Aaron believes that the goal of animal shelters should be to ultimately put themselves out of business. Ideally, by working to keep dogs from being neglected and out of rescues, Atlanta Rescue Dog Cafe aims to create a future where rescues are no longer needed, and they plan on doing this through conversation and education. Atlanta Rescue Dog Cafe operates under the belief that if the rates of pet neglect and abuse are going to go down, it needs to start with education. Two of the main causes that lead to dogs entering shelters are dogs biting people or dogs becoming strays. With this in mind, Atlanta Rescue Dog Cafe works to educate people on how to prevent pets from becoming strays and avoid bites, which drastically improves the chances that dogs won’t be placed in rescues. 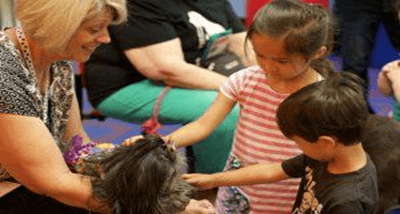 By encouraging children to ask, “May I please pet your dog?,” before doing so, or by showing the benefits of dog collars so that runaways have a much higher chance of being returned home, Atlanta Rescue Dog Cafe makes great strides in improving dog and people relations. While the organization does work to educate people of all ages on dog handling, a major part of their target audience is students. Aaron, talked about how it is especially important to teach people while they’re young so that they can form healthy habits early on. With the goal being to start and facilitate conversations with students about animal welfare, an obstacle soon presented itself. Having worked with students as a teacher for seven years, Aaron knew from the beginning that if he was going to bring his courses on pet safety into schools, he was going to have to justify it as a natural part of the curriculum. This led to the birth of Atlanta Rescue Dog Cafe’s One Leash Project. The One Leash Project is an educational program that fuses traditional curriculum, like math, science, and writing, with the organization’s curriculum on both human and pet safety. In this program, students make dog leashes from repurposed climbing rope. 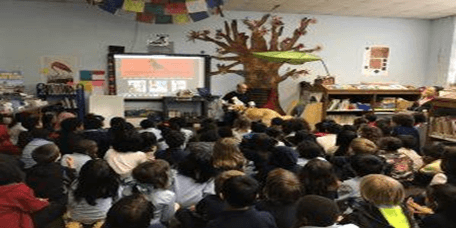 By demonstrating the importance of recycling and teamwork, along with scaling the experience to the students’ ages, the One Leash Project has opened many doors that allow Atlanta Rescue Dog Cafe to facilitate conversations with students on the importance of animal welfare. With the One Leash Project, and other programs like “Careers in Animal Welfare” and “Can I Pet Your Dog?”, Atlanta Rescue Dog Cafe has facilitated conversations with nearly four thousand residents of Atlanta. While they are making great strides to lower the rates of animal neglect, they cannot do it alone. This is why Atlanta Rescue Dog Cafe is centered so much on conversation and engagement. The best way to fight animal neglect is through awareness and the best way to raise awareness is through conversation. However, even with an average of reaching 500 students a month they can’t reach everyone. This is why it is important for people to join the conversation. By having conversations about animal welfare spread beyond Atlanta Rescue Dog Cafe, the rate of awareness of dog neglect and how to prevent it will grow exponentially. Beyond just having simple conversations with family and friends about the importance of animal welfare, one of the best ways to become part of the conversation for preventing dog neglect is by attending festivals.